Family Research Council’s Peter Sprigg, a prominent anti-LGBT activist was “teleported” onto the CNN “New Day” set and plopped smack dab in the middle of a gay pride flag. 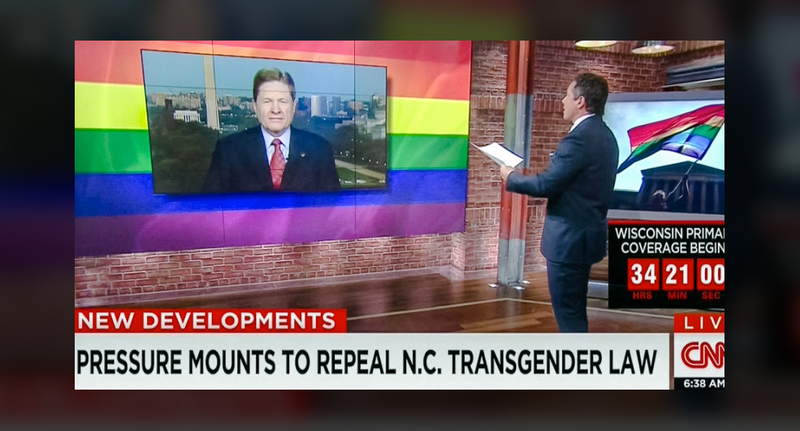 Sprigg was being interviewed by anchor Chris Cuomo from Washington, D.C. for a segment on the recent anti-transgender law controversy in North Carolina. Cuomo, who was standing in the New York studio, used one of the set’s large video walls to “face off” with Sprigg. Apparently not wanting to fill the entire screen with Sprigg’s live feed, CNN inset his image atop a prominent rainbow flag backdrop. It’s worth noting that some members of the transgender community actually prefer an alternate pride flag — a white, pale blue and pale pink design, though the rainbow flag is also meant to be all-inclusive.